A bipartisan trio of lawmakers introduced an amendment to the National Defense Authorization Act pushing back on national security threats posed by Chinese telecom giants Huawei and ZTE. Sen. Tom Cotton (R., Ark. ), Senate Minority Leader Chuck Schumer (D., N.Y.), and Sen. Chris Van Hollen (D., Md.) sponsored an amendment that would prohibit U.S. government agencies from purchasing or leasing telecommunications equipment or services from Huawei, ZTE or any of its affiliates or subsidiaries, according to a release. ZTE and Huawei have been linked by U.S. intelligence agencies to electronic spying by Beijing, the Free Beacon reports. The Pentagon banned the use of both companies' cell phones over the spying concerns. The bipartisan proposal would also ban the U.S. government from subsidizing the companies and its affiliates through grants and loans, and it would restore penalties. 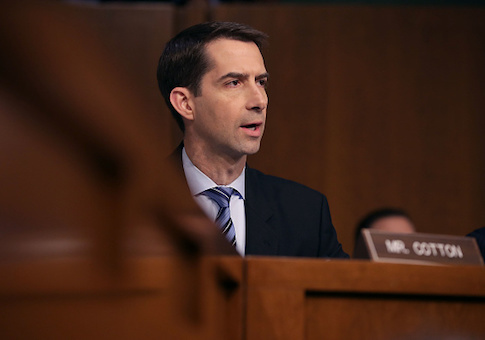 "Huawei and ZTE have extensive ties with the Chinese Community Party, as well as a track record of doing business with rogue regimes like North Korea and Iran," Cotton said in a statement. "So it’s only prudent that no one in the federal government use their equipment or services and that they receive no taxpayer dollars. Given their repeated violations of U.S. law, we cannot trust them to respect U.S. national security, and so it’s vital we hold them accountable and pass this amendment." "In a country full of bad actors when it comes to hurting American jobs and threatening our national security, Huawei and ZTE are two of the absolute worst offenders," Schumer said. "Both parties in Congress must come together to bring the hammer down on these companies rather than offer them a second chance, and this new bipartisan amendment will do just that." "ZTE has flagrantly and repeatedly violated U.S. laws, and any deal to let them off the hook should not move forward. This amendment will ensure that, regardless of action the Administration takes right now, Congress will protect American interests and national security," Van Hollen said. Cosponsoring the legislation are Sens. Marco Rubio (R., Fla.), Bill Nelson (D., Fla.), Richard Blumenthal (D., Conn.) and Susan Collins (R., Maine.). Commerce Secretary Wilbur Ross announced Thursday the U.S. had struck a deal with ZTE to end sanctions against the company, which included a $1 billion penalty and the creation of a compliance department. The department will be embedded in the company and its members will be picked by the U.S. This entry was posted in National Security and tagged China, Chris Van Hollen, Chuck Schumer, Tom Cotton. Bookmark the permalink.